I made these hair bows for my cousin's daughter. I"m not sure what relationship that makes us; I get confused at anything past "cousin". Anyway, she's a little doll and finally has enough hair at 2 years old to wear bows. At her birthday party, Joshua got stung by a bee on his finger and is tramatized. Last night he woke up screaming 6 times because he had nightmares about bees. 6 times!!! I finally told him to try to dream about school and that worked. Any other mom ideas for dealing with nightmares? What is that circular thing, and how do you have the ribbons fastened to it? 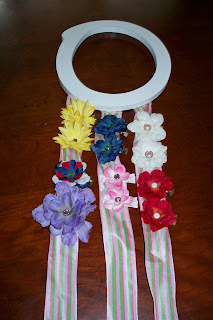 I do something similar for Nora's hair bows, but this is more efficient. Can you e-mail me??? Olivia has worn one of these every day since we got them! They are too cute and stay in her hair good! I am so sorry about Joshua. Poor thing! At least you know now that he isn't allergic to bee stings.